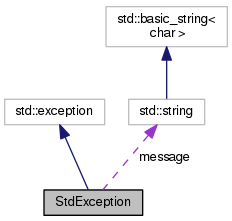 Simple exception class that implements the what() function of std::exception to specify an error message. Definition at line 23 of file StdException.h. Constructor that sets the error message object to "Error." Definition at line 18 of file StdException.cpp. Constructor that sets the error message object to the string given. Definition at line 26 of file StdException.cpp. Definition at line 34 of file StdException.cpp. Returns the error message object as a character array. Definition at line 40 of file StdException.cpp. Definition at line 47 of file StdException.h. Referenced by StdException(), and what().